Yep, yep, yep. That'll do. It was light and entertaining, probably not something you'd normally associate with novels of the era. 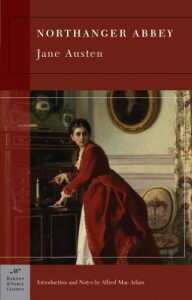 This was my first Jane Austen, can you believe? Living near her home, I was aware that she used familiar settings, but when she mentioned Petty France, I started looking at the map for the fictional Northanger Abbey wondering if there was an inspiration for the house or if she just picked Petty France out of a hat. Even without the local intrigue, it was a great book. Catherine was sweet and acted her age; it was like reading your daughter's diary, or being a teenager yourself again. I thought it very amusing that everyone around her gave in to her fantasies and let her ideas of life blow along with the wind. I'm still caught up in the moment and writing in my own diary. To be young and fanciful again.